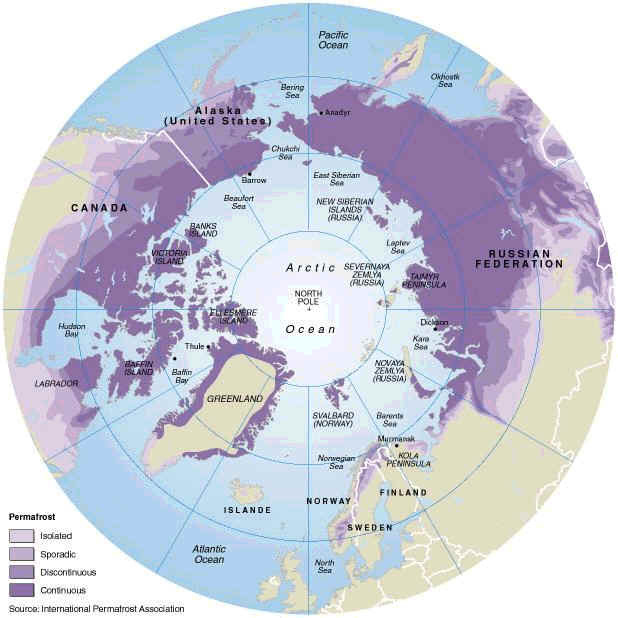 Most permafrost in the Northern Hemisphere occurs between latitudes of 60°N and 68°N. (North of 67°N, permafrost declines sharply, as the exposed land surface gives way to the Arctic Ocean.) There is also a significant amount of permafrost around 35°N, in the Qinghai-Xizang (Tibet) Plateau, and in the mountains of southwest Asia and the U.S. Rocky Mountains. Permafrost is not defined by soil moisture content, overlying snow cover, or location; it's defined solely by temperature. 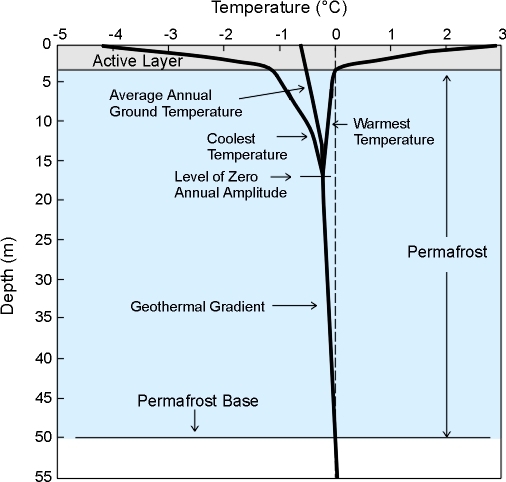 Any rock or soil remaining at or below 0°C (32° F) or two or more years is permafrost. 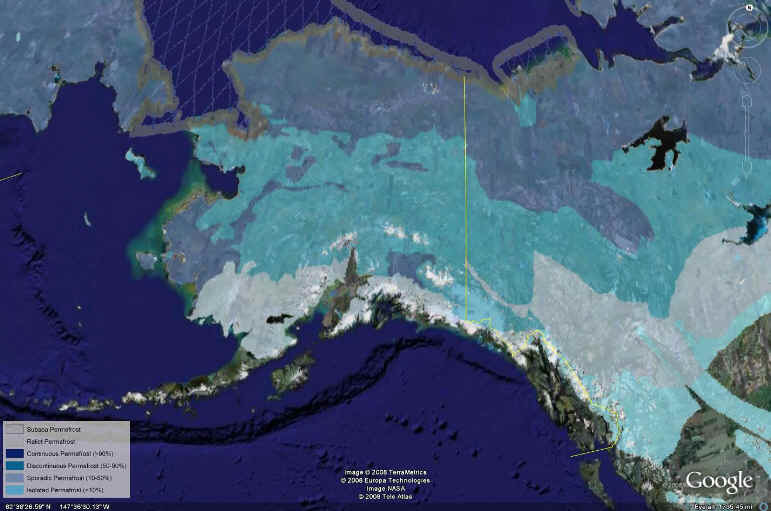 Permafrost can contain over 30 percent ice, or practically no ice at all. It can be overlain by several meters of snow, or little or no snow. Understanding permafrost is not only important to civil engineering and architecture, it's also a crucial part of studying global change and protecting the environment in cold regions. What are the types of frozen ground? Frozen ground is can be either seasonally frozen ground or permafrost. Seasonally frozen ground freezes in the winter and thaws in the summer. More than half of the land in the Northern Hemisphere has some seasonally frozen ground. Permafrost is a type of frozen ground that stays at or below 0° Celsius (32° Fahrenheit) for at least two years. Permafrost does not have to contain water or ice. As long as the temperature of the ground stays below freezing, it is still considered frozen ground, even if it is completely dry. If permafrost begins to warm significantly, it thaws. These two types of frozen ground can occur separately, or together. A layer of ground that freezes and thaws every year may sit on top of permafrost. This is called the active layer. The active layer is seasonally frozen ground, and is not part of the permafrost. Permafrost begins where the seasonally frozen ground ends. Continuous permafrost Continuous permafrost exists under almost the entire land surface in an area. Areas with continuous permafrost often have permafrost layers more than 100 meters (330 feet) thick. The deepest permafrost ever found is in Siberia, a region in northern Russia. One area in Siberia has a permafrost layer that extends down 1,650 meters (5,413 feet). Discontinuous permafrost Discontinuous permafrost exists under a large portion of a particular area or only in a few specific places. Alpine permafrost is discontinuous permafrost that exists on the tops of mountains where the ground stays very cold. In areas with discontinuous permafrost, the permafrost layer may extend as deep as ten meters (thirty-three feet) underground. Taliks are sections of unfrozen ground within permafrost. Discontinuous permafrost can be isolated or sporadic. It is called isolated if less than ten percent of the surface has permafrost under it. Sporadic means ten to fifty percent of the surface has permafrost under it. Cold permafrost — Remains below 30° F, and which may be as low as 10° F as on the North Slope; tolerates introduction of considerable heat without thawing. Ice-rich — 20% to 50% visible ice. Thaw-stable — Permafrost in bedrock, in well drained, coarse-grained sediments such as glacial outwash gravel, and in many sand and gravel mixtures. Subsidence or settlement when thawed is minor, foundation remains essentially sound. 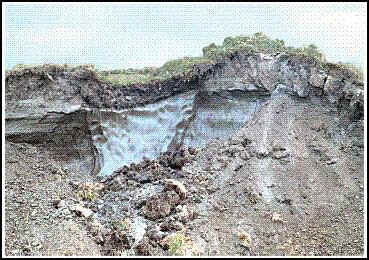 Thaw-unstable — Poorly drained, fine grained soils, especially silts and clays. Such soils generally contain large amounts of ice. The result of thawing can be loss of strength, excessive settlement and soil containing so much moisture that it flows. Warm permafrost — Remains just below 32° F. The addition of very little additional heat may induce thawing. Despite its name, permafrost is characterized by its instability. It is often covered by an active layer that regularly melts. Although permafrost can be thousands of years old, it is sometimes newly formed or about to melt, and it often exists close to its melting point . As permafrost thaws, it jeopardizes both man-made structures and natural features. Thawing permafrost on mountain slopes can lead to landslides . Approximately 55 percent of the Northern Hemisphere's land surface is covered by seasonally frozen ground, which can last for a few weeks in the middle and lower latitudes, and for several months at high latitudes and high elevations . 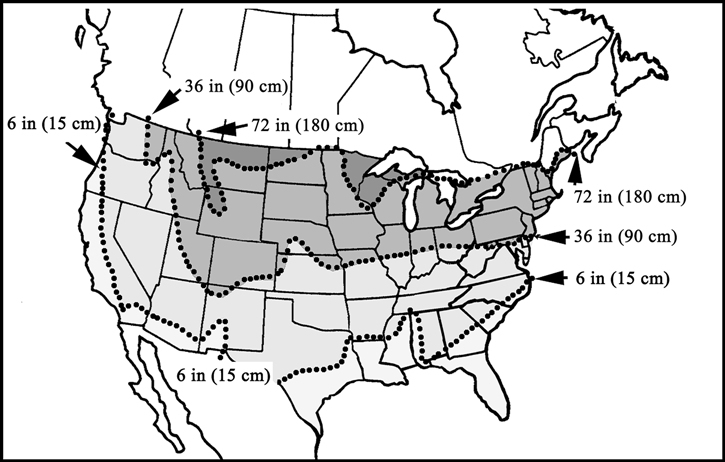 Much of the Northern Hemisphere frozen ground is overlain by evergreen boreal forest. These boreal forests comprise both a source and a sink of carbon. 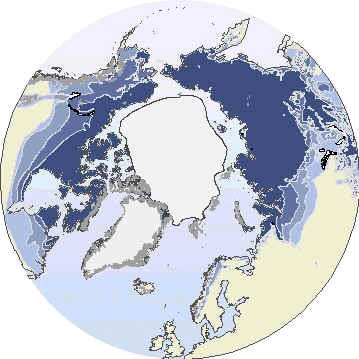 In fact, the Arctic contains nearly one-third of the Earth's stored soil carbon. If the high northern latitudes were to have a significant temperature increase, the regional soils would begin to release carbon into the atmosphere, which could lead to increased plant growth, carbon aspiration, and possibly a temperature drop or stabilization. Alternately, it could lead to higher temperatures, fueling the cycle of carbon release and temperature rise . Frozen ground's widespread distribution makes it a substantial component of the cryosphere. Likewise, its role in the storage and release of carbon make it a major factor in future global change. General circulation models predict that, for a doubling of atmospheric concentrations of carbon dioxide due to anthropogenic sources, mean annual air temperatures may rise up to several degrees over much of the Arctic. In the discontinuous permafrost region, where ground temperatures are within 1-2 degrees of melting, permafrost will likely ultimately disappear as a result of ground thermal changes associated with global climate warming. Where ground ice contents are high, this permafrost degradation will have associated physical impacts. Of greatest concern are soils with the potential for instability upon thaw (thaw settlement, creep or slope failure). Such instabilities may have implications for the landscape, ecosystems, and infrastructure.